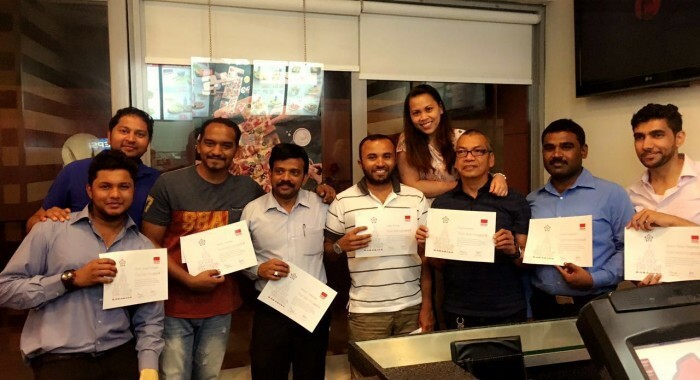 Last month, we shared with you what an amazing job the GSS Bahrain Customer Service team did when they mobilised an entire project in 18 days, without a glitch! The team’s amazing display of team spirit was recently recognised by much-deserved Winning Hearts awards! Charles Swamy, GSS Sales Manager, presented the awards to Rumesh, Dipesh, Ashraf, Cedric, Manielyn, Raul, Sahad and Ahmed, for their continued collaborative work to support the NEX produce operations during the mobilisation and start-up phase. The team was able to secure a contract for the produce counter at NEX for a base period of three years, further extendable for an additional two years! This is a responsibility the team does not take lightly. Every member of the team has worked tirelessly for 10 to 12 hours per day in order to cover for staff shortages in the produce section, as well as doing their regular duties in the chilled section and their usual office tasks. The effort has definitely paid off – the NEX contracting officer, as well as customers, have noticed a major change from the last vendor and have had a multitude of positive comments about the GSS Customer Service team. “I would like to take this opportunity to say a big thank you to every single member of the team for their continued support and for a job amazingly well done. Keep up the great work!” said Charles.